In an earlier post, I had mentioned Esri’s involvement in the large National Science Foundation-funded project known as CyberGIS, which aims to establish a fundamentally new software framework via a seamless integration of cyberinfrastructure, GIS, and spatial analysis/modeling capabilities, particularly for big data. The project team is led by Professor Shaowen Wang at the University of Illinois, Urbana-Champaign and involves scientists from Arizona State, University of Washington, the San Diego Supercomputer Center, UCSB, the U.S. Geological Survey (USGS), and the Department of Energy’s Oak Ridge National Laboratory (ORNL). A recent CyberGIS “All Hands Meeting” in Seattle allowed project partners, including Esri, to share progress to date, and to discuss and plan research activities and products for the next few years. CyberGIS may be a new term to many, and may be evolving into a new field all its own. At Esri, we understand cyberGIS to essentially mean GIS detached from the desktop and deployed on the web, with the associated issues of hardware software, data storage, digital networks, people, training and education. This deployment may involve an individual, isolated server; a broader enterprise scenario including connection to a universe of mobile devices; or an even more pervasive deployment in the cloud. With the advent of cloud computing coupled with web mapping as a new platform for GIS, there is an opportunity to reinvent GIS applications, as well as to extend the discovery and availability of spatial data and geospatial analyses. Cloud computing provides the potential for access to and publication of dynamic data, as well as the consumption of real-time information for analysis and modeling. A summary graphic of ArcGIS Online within the broader ArcGIS Platform, presented by Esri’s Steve Kopp at CyberGIS AHM ’13, highlighting the full breadth of “cyberGIS” capabilities to date, including various web service types, computing platforms served, API languages used, and the connection of ArcGIS Online to the high-performance, supercomputing environment of the CyberGIS Gateway. Click to enlarge. Although still to be proven conclusively in all possible use cases, the potential of clouds (with their rich collection of software modules, APIs, general- and special-purpose computation, and data storage) is extremely promising as an infrastructure for cyberGIS, and ultimately for e-science. We argue therefore, that in order to best achieve effective sharing and collaboration of data, users, and communities, one must also seek to understand the advantages and limitations of cloud computing in the context of spatial computation. In other words, cloud computing (and hence cloud GIS) needs to always be in the conversation when discussing CyberGIS. Cloud GIS allows one to use GIS over the web without the cost and complexity of buying and managing the underlying hardware, software, and/or web server capabilities. In principle, it is always on, always available, and provides state-of-the-art functions that are supposed to be highly reliable and flexible enough to handle large volumes of Internet traffic. Further, there is the notion of an “intelligent web map,” a medium by which to integrate multiple map services, data services, and analytical model services together, and to embed them in a browser or a web site, share them on a mobile device, or integrate them into social media. Such services support editing, pop-up windows, time-enabled slider functions, and the building of additional analytics and workflows so that changes made to the original data, to the analytic model dependent on the data, and to the properties of cartographic map layers, are immediately updated on the web map, in near-real time. We further posit that cyberGIS should provide as a fundamental component an environment in which to perform and evaluate a wide array of spatial analyses in a “community playground” of datasets, maps, scripts, web-based geoprocessing services, and GIS analysis models. The “playground” may be in the context of an Intranet within organizations (e.g., private clouds, including virtual organizations), as well as the broader Internet (public clouds). With a low barrier to entry, a cloud-hosted environment for users to leverage as a platform for sharing, communication, and collaboration is achievable, and currently available in a variety of forms. An explosion of content: Content includes basemaps, web maps, imagery, demographics, and boundaries, much of which is exposed via pop-ups and infographics. The past year has also seen the integration of ArcGIS Online and the leveraging of the Esri topography, street, and imagery basemaps within the CyberGIS Gateway, allowing the reuse of content between the two sites. There are now ~300 user organizations registered in Esri’s Community Maps 2.0 system underlying ArcGIS Online. These organizations have contributed tens of millions of features in over 20 layers. The freely-accessible content within ArcGIS Online is continuously growing, evolving, and being updated, thus fueling a host of analytic services in the cloud, as well as geoenrichment services. Social platforms: Esri is broadening its support of community efforts to create a social platform for GIS and geographic education. As computing becomes more “consumerized,” one of the interesting trends we see revolves around such social platforms. This is driving profound changes, even within commercial companies. For example, at Esri we are doing more and more with GitHub (http://esri.github.io) and using “social coding” practices for our own project management across our development teams. In addition, we are sharing many of our apps online as open source for developers from many user communities to leverage. Ready-to-use-services: These are new Esri-hosted, cloud-hosted analytic services that perform functions on Esri-hosted, Esri-curated data. These services (e.g., create viewshed, profile, or watershed) assist users with large, complicated, difficult-to-build data such as elevation and hydrology, and can be used either on the web or directly from ArcGIS Desktop. ArcGIS Online analytics: These are GIS analysis capabilities (e.g., aggregate points, find hot spots, create buffers, overlay layers, summarize within or nearby, create drive-time areas, extract or enrich data, find nearest, site suitability, raster analysis, etc.) already familiar to ArcGIS Desktop users, but now already built into the web map to help non-GIS specialists quickly answer simple, straightforward analytical questions. Indeed, in the broader scheme, exposing the power of spatial analysis to a larger audience (the non-GIS audience) may be the biggest long-term value of cyberGIS. And yet it poses one of the most fundamental challenges: how best to make cyberGIS easier to use, easier for solving spatial problems, while still maintain scientific rigor? We have more people now who are expert in GIS in its many forms (desktop, server, mobile, and cloud), so there is hope that some of that intellectual capacity will be devoted to making things easier, using the experiences of users to make things more interactive, more exploratory. We can ask questions about phenomena at finer and finer scales, all the while applying more computationally-intensive algorithms not broached in the past. As barriers to entry into cyberGIS environments continue to fall away, confidence in consuming and leveraging both public and private clouds for non-GIS audiences will be bolstered through the successes, ease of collaboration, and agility that on-demand cloud-hosted services can offer. 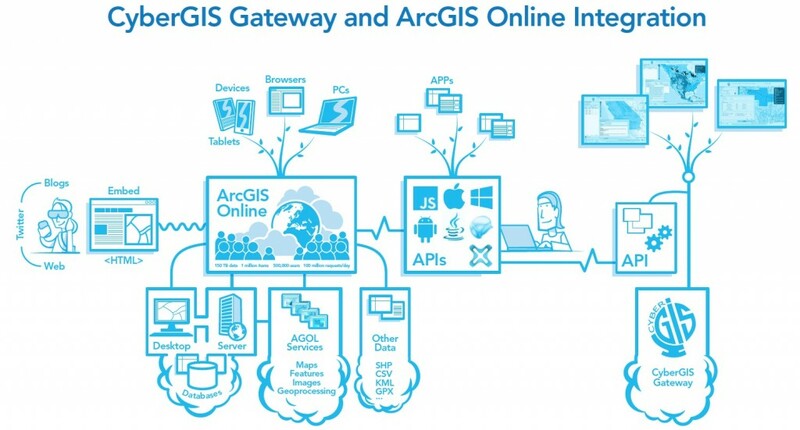 This is ultimately one of the goals of cyberGIS: to integrate and synthesize data and information from multiple sources, thereby facilitating communication and collaboration, and breaking down barriers between institutions, disciplines, and cultures, fostering a better connection between cyberGIS and its many communities. Thanks to Steve Kopp and Clint Brown who contributed to this post.